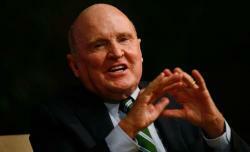 Jack Welch tweets about job numbers: Republicans don’t believe Labor Department jobs report. Anything but good news! That could be the mantra of the Republican Party right now—they’re hoping for gloom and doom from now until Nov. 6. Keep the flow of negative news that will reinforce the desire, they desperately hope, for Mitt’s magic wand to replace the hand of President Obama at the tiller of the ship of state. So it must have been devastating for them to see a good jobs report this morning—we just had the 31st straight month of private sector job growth, bringing the total number of private sector jobs created under the president to more 4.6 million, and the unemployment rate dropped by three-tenths of a point to 7.8 percent! The rate is now below where it was when Obama took over as the George W. Bush cataclysm was gaining steam. Shouldn’t we all be overjoyed? Shame on you, Jack. The notion that the Department of Labor plays games with these numbers for political reasons is silly, ludicrous, and insulting to government workers who have reported new figures—good and bad—faithfully for many decades. It strikes me, Jack, that there have been more cases of corporate gamesmanship with financial numbers in the past few years than cases in which the government wasn’t honest. In fact, didn’t your company, GE, have an accounting issue that led to a big SEC settlement not so long ago? So, Jack, now that you have made this outlandish claim, where is your proof—your evidence, any facts—to substantiate your assertion? Or is it just a partisan screed? You might recall that when my office charged GE—then under your leadership—with a range of impropriety, we had the proof, and a judge forced your company to take out full-page ads admitting your wrongdoing. The key, Jack? Evidence and facts. But more importantly, why should anybody be surprised that we are finally digging out of the trough? I know, the corporate titans want to believe that until their taxes are cut to zero, nothing good will happen. But here’s the thing. Over the past four years, the steady effort at a Keynesian stimulus, monetary policy that has cut interest rates to near zero, and smart government investments in the auto sector and yes, even in green energy, have begun to have an impact. So while Mitt Romney thinks he can solve our fiscal problems by firing Big Bird, the White House has actually begun solving our problems by focusing on a jobs agenda.